For the American bicycle framebuilder, see David Henry Bohm. 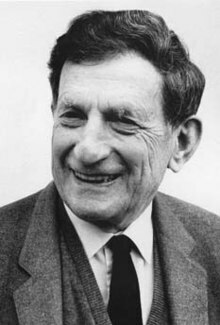 David Joseph Bohm FRS (/boʊm/; December 20, 1917 – October 27, 1992) was an American scientist who has been described as one of the most significant theoretical physicists of the 20th century and who contributed unorthodox ideas to quantum theory, neuropsychology and the philosophy of mind. Bohm warned of the dangers of rampant reason and technology, advocating instead the need for genuine supportive dialogue, which he claimed could broaden and unify conflicting and troublesome divisions in the social world. In this, his epistemology mirrored his ontology. Due to his Communist affiliations, Bohm was the subject of a federal government investigation in 1949, prompting him to leave the United States. He pursued his scientific career in several countries, becoming first a Brazilian and then a British citizen. He abandoned Marxism in the wake of the Hungarian Uprising in 1956. Bohm's main concern was with understanding the nature of reality in general and of consciousness in particular as a coherent whole, which according to Bohm is never static or complete but rather an unfolding process. Bohm was born in Wilkes-Barre, Pennsylvania, to a Hungarian Jewish immigrant father, Samuel Bohm, and a Lithuanian Jewish mother. He was raised mainly by his father, a furniture-store owner and assistant of the local rabbi. Despite being raised in a Jewish family, he became an agnostic in his teenage years. Bohm attended Pennsylvania State College (now Pennsylvania State University), graduating in 1939, and then the California Institute of Technology, for one year. He then transferred to the theoretical physics group directed by Robert Oppenheimer at the University of California, Berkeley Radiation Laboratory, where he obtained his doctorate. Bohm lived in the same neighborhood as some of Oppenheimer's other graduate students (Giovanni Rossi Lomanitz, Joseph Weinberg, and Max Friedman) and with them became increasingly involved in radical politics. He was active in communist and communist-backed organizations, including the Young Communist League, the Campus Committee to Fight Conscription, and the Committee for Peace Mobilization. During his time at the Radiation Laboratory, Bohm was in a relationship with the future Betty Friedan and also helped to organize a local chapter of the Federation of Architects, Engineers, Chemists and Technicians, a small labor union affiliated to the Congress of Industrial Organizations (CIO). During World War II, the Manhattan Project mobilized much of Berkeley's physics research in the effort to produce the first atomic bomb. Though Oppenheimer had asked Bohm to work with him at Los Alamos (the top-secret laboratory established in 1942 to design the atom bomb), the project's director, Brigadier General Leslie Groves, would not approve Bohm's security clearance after seeing evidence of his politics and his close friendship with Weinberg, who had been suspected of espionage. During the war, Bohm remained at Berkeley, where he taught physics and conducted research in plasma, the synchrotron and the synchrocyclotron. He completed his Ph.D. in 1943 by an unusual circumstance. According to biographer F. David Peat (see reference below, p. 64), "The scattering calculations (of collisions of protons and deuterons) that he had completed proved useful to the Manhattan Project and were immediately classified. Without security clearance, Bohm was denied access to his own work; not only would he be barred from defending his thesis, he was not even allowed to write his own thesis in the first place!" To satisfy the University, Oppenheimer certified that Bohm had successfully completed the research. Bohm later performed theoretical calculations for the Calutrons at the Y-12 facility in Oak Ridge, Tennessee, which was used for the electromagnetic enrichment of uranium for the bomb dropped on Hiroshima in 1945. After the war, Bohm became an assistant professor at Princeton University. He also worked closely with Albert Einstein at the nearby Institute for Advanced Study. In May 1949, the House Un-American Activities Committee called upon Bohm to testify because of his previous ties to suspected communists. Bohm invoked his Fifth Amendment right to refuse to testify, and he refused to give evidence against his colleagues. In 1950, Bohm was arrested for refusing to answer the committee's questions. He was acquitted in May 1951, but Princeton had already suspended him. After his acquittal, Bohm's colleagues sought to have him reinstated at Princeton, but Princeton President Harold W. Dodds decided not to renew Bohm's contract. Although Einstein considered appointing him as his research assistant at the Institute, Oppenheimer (who had served as the Institute's president since 1947) "opposed the idea and [...] advised his former student to leave the country." His request to go to the University of Manchester received Einstein's support but was unsuccessful. Bohm then left for Brazil to assume a professorship of physics at the University of São Paulo, at Jayme Tiomno's invitation and on the recommendation of both Einstein and Oppenheimer. The Bohmian trajectories for an electron going through the two-slit experiment. A similar pattern was also observed for single photons. During his early period, Bohm made a number of significant contributions to physics, particularly quantum mechanics and relativity theory. As a postgraduate at Berkeley, he developed a theory of plasmas, discovering the electron phenomenon now known as Bohm diffusion. His first book, Quantum Theory, published in 1951, was well received by Einstein, among others. But Bohm became dissatisfied with the orthodox interpretation of quantum theory he wrote about in that book. Starting from the realization that the WKB approximation of quantum mechanics leads to deterministic equations and convinced that a mere approximation could not turn a probabilistic theory into a deterministic theory, he doubted the inevitability of the conventional approach to quantum mechanics. Bohm's aim was not to set out a deterministic, mechanical viewpoint but to show that it was possible to attribute properties to an underlying reality, in contrast to the conventional approach. He began to develop his own interpretation (the De Broglie–Bohm theory, also called the pilot wave theory), the predictions of which agreed perfectly with the non-deterministic quantum theory. He initially called his approach a hidden variable theory, but he later called it ontological theory, reflecting his view that a stochastic process underlying the phenomena described by his theory might one day be found. Bohm and his colleague Basil Hiley later stated that they had found their own choice of terms of an "interpretation in terms of hidden variables" to be too restrictive, especially since their variables, position, and momentum "are not actually hidden." After Bohm's arrival in Brazil on October 10, 1951, the US Consul in São Paulo confiscated his passport, informing him he could retrieve it only to return to his country, which reportedly frightened Bohm and significantly lowered his spirits, as he had hoped to travel to Europe. He applied for and received Brazilian citizenship, but by law, had to give up his US citizenship; he was able to reclaim it only decades later, in 1986, after pursuing a lawsuit. At the University of São Paulo, Bohm worked on the causal theory that became the subject of his publications in 1952. Jean-Pierre Vigier traveled to São Paulo, where he worked with Bohm for three months; Ralph Schiller, student of cosmologist Peter Bergmann, was his assistant for two years; he worked with Tiomno and Walther Schützer; and Mario Bunge stayed to work with him for one year. He was in contact with Brazilian physicists Mário Schenberg, Jean Meyer, Leite Lopes, and had discussions on occasion with visitors to Brazil, including Richard Feynman, Isidor Rabi, Léon Rosenfeld, Carl Friedrich von Weizsäcker, Herbert L. Anderson, Donald Kerst, Marcos Moshinsky, Alejandro Medina, and the former assistant to Heisenberg, Guido Beck, who encouraged him in his work and helped him to obtain funding. The Brazilian CNPq explicitly supported his work on the causal theory and funded several researchers around Bohm. His work with Vigier was the beginning of a long-standing cooperation between the two and Louis De Broglie, in particular, on connections to the hydrodynamics model proposed by Madelung. Yet the causal theory met much resistance and skepticism, with many physicists holding the Copenhagen interpretation to be the only viable approach to quantum mechanics. From 1951 to 1953, Bohm and David Pines published the articles in which they introduced the random phase approximation and proposed the plasmon. In 1955 Bohm relocated to Israel, where he spent two years working at the Technion, at Haifa. There, he met Sarah ("Saral") Woolfson, whom he married in 1956. In 1957, Bohm and his student Yakir Aharonov published a new version of the Einstein–Podolsky–Rosen (EPR) paradox, reformulating the original argument in terms of spin. It was that form of the EPR paradox that was discussed by John Stewart Bell in his famous paper of 1964. Schematic of double-slit experiment in which Aharonov–Bohm effect can be observed: electrons pass through two slits, interfering at an observation screen, with the interference pattern shifted when a magnetic field B is turned on in the cylindrical solenoid. In 1957, Bohm relocated to the United Kingdom as a research fellow at the University of Bristol. In 1959, Bohm and Aharonov discovered the Aharonov–Bohm effect, showing how a magnetic field could affect a region of space in which the field had been shielded, but its vector potential did not vanish there. That showed for the first time that the magnetic vector potential, hitherto a mathematical convenience, could have real physical (quantum) effects. In 1961, Bohm was made professor of theoretical physics at the University of London's Birkbeck College, becoming emeritus in 1987. His collected papers are stored there. At Birkbeck College, much of the work of Bohm and Basil Hiley expanded on the notion of implicate, explicate, and generative orders proposed by Bohm. In the view of Bohm and Hiley, "things, such as particles, objects, and indeed subjects" exist as "semi-autonomous quasi-local features" of an underlying activity. Such features can be considered to be independent only up to a certain level of approximation in which certain criteria are fulfilled. In that picture, the classical limit for quantum phenomena, in terms of a condition that the action function is not much greater than Planck's constant, indicates one such criterion. They used the word "holomovement" for the activity in such orders. In a holographic reconstruction, each region of a photographic plate contains the whole image. In collaboration with Stanford University neuroscientist Karl H. Pribram, Bohm was involved in the early development of the holonomic model of the functioning of the brain, a model for human cognition that is drastically different from conventionally-accepted ideas. [not in citation given] Bohm worked with Pribram on the theory that the brain operates in a manner that is similar to a hologram, in accordance with quantum mathematical principles and the characteristics of wave patterns. In addition to his scientific work, Bohm was deeply interested in exploring the nature of consciousness, with particular attention to the role of thought as it relates to attention, motivation, and conflict in the individual and in society. Those concerns were a natural extension of his earlier interest in Marxist ideology and Hegelian philosophy. His views were brought into sharper focus through extensive interactions with the psychological philosopher Jiddu Krishnamurti, beginning in 1961. Their collaboration lasted a quarter of a century, and their recorded dialogues were published in several volumes. Bohm's prolonged involvement with the philosophy of Krishnamurti was regarded somewhat skeptically by some of his scientific peers. A more recent and extensive examination of the relationship between the two men presents it in a more positive light and shows that Bohm's work in the psychological field was complementary to and compatible with his contributions to theoretical physics. The mature expression of Bohm's views in the psychological field was presented in a seminar conducted in 1990 at the Oak Grove School, founded by Krishnamurti in Ojai, California. It was one of a series of seminars held by Bohm at Oak Grove School, and it was published as Thought as a System. In the seminar, Bohm described the pervasive influence of thought throughout society, including the many erroneous assumptions about the nature of thought and its effects in daily life. In the seminar, Bohm develops several interrelated themes. He points out that thought is the ubiquitous tool that is used to solve every kind of problem: personal, social, scientific, and so on. Yet thought, he maintains, is also inadvertently the source of many of those problems. He recognizes and acknowledges the irony of the situation: it is as if one gets sick by going to the doctor. Bohm maintains that thought is a system, in the sense that it is an interconnected network of concepts, ideas and assumptions that pass seamlessly between individuals and throughout society. If there is a fault in the functioning of thought, therefore, it must be a systemic fault, which infects the entire network. The thought that is brought to bear to resolve any given problem, therefore, is susceptible to the same flaw that created the problem it is trying to solve. Thought proceeds as if it is merely reporting objectively, but in fact, it is often coloring and distorting perception in unexpected ways. What is required in order to correct the distortions introduced by thought, according to Bohm, is a form of proprioception, or self-awareness. Neural receptors throughout the body inform us directly of our physical position and movement, but there is no corresponding awareness of the activity of thought. Such an awareness would represent psychological proprioception and would enable the possibility of perceiving and correcting the unintended consequences of the thinking process. In his book On Creativity, quoting the work of Korzybski, Bohm expressed the view that "metaphysics is an expression of a world view" and is "thus to be regarded as an art form, resembling poetry in some ways and mathematics in others, rather than as an attempt to say something true about reality as a whole." Bohm was keenly aware of various ideas outside the scientific mainstream. In his book Science, Order and Creativity, Bohm referred to the views of various biologists on the evolution of the species, including Rupert Sheldrake. He also knew the ideas of Wilhelm Reich. Contrary to many other scientists, Bohm did not exclude the paranormal out of hand. Bohm temporarily even held Uri Geller's bending of keys and spoons to be possible, prompting warning remarks by his colleague Basil Hiley that it might undermine the scientific credibility of their work in physics. Martin Gardner reported this in a Skeptical Inquirer article and also critiqued the views of Jiddu Krishnamurti, with whom Bohm had met in 1959 and had had many subsequent exchanges. Gardner said that Bohm's view of the interconnectedness of mind and matter (on one occasion, he summarized, "Even the electron is informed with a certain level of mind.") "flirted with panpsychism." To address societal problems during his later years, Bohm wrote a proposal for a solution that has become known as "Bohm Dialogue", in which equal status and "free space" form the most important prerequisites of communication and the appreciation of differing personal beliefs. An essential ingredient in this form of dialogue is that participants "suspend" immediate action or judgment and give themselves and each other the opportunity to become aware of the thought process itself. Bohm suggested that if the "dialogue groups" were experienced on a sufficiently-wide scale, they could help overcome the isolation and fragmentation that Bohm observed in society. Bohm continued his work in quantum physics after his retirement, in 1987. His final work, the posthumously-published The Undivided Universe: An Ontological Interpretation of Quantum Theory (1993), resulted from a decades-long collaboration with Basil Hiley. He also spoke to audiences across Europe and North America on the importance of dialogue as a form of sociotherapy, a concept he borrowed from London psychiatrist and practitioner of Group Analysis Patrick de Maré, and he had a series of meetings with the Dalai Lama. He was elected Fellow of the Royal Society in 1990. Near the end of his life, Bohm began to experience a recurrence of the depression that he had suffered earlier in life. He was admitted to the Maudsley Hospital in South London on 10 May 1991. His condition worsened and it was decided that the only treatment that might help him was electroconvulsive therapy. Bohm's wife consulted psychiatrist David Shainberg, Bohm's longtime friend and collaborator, who agreed that electroconvulsive treatments were probably his only option. Bohm showed improvement from the treatments and was released on 29 August, but his depression returned and was treated with medication. Bohm died after suffering a heart attack in Hendon, London, on 27 October 1992, at 74. In the early 1950s, Bohm's causal quantum theory program was mostly negatively received, with a widespread tendency among physicists to systematically ignore both Bohm personally and his ideas. There was a significant revival of interest in Bohm's ideas in the late 1950s and the early 1960s; the Ninth Symposium of the Colston Research Society in Bristol in 1957 was a key turning point toward greater tolerance of his ideas. 1985. The Ending of Time, with Jiddu Krishnamurti, San Francisco: Harper, ISBN 0-06-064796-5. 1987. Science, Order, and Creativity, with F. David Peat. London: Routledge. 2nd ed. 2000. ISBN 0-415-17182-2. 1989. Meaning And Information, In: P. Pylkkänen (ed. ): The Search for Meaning: The New Spirit in Science and Philosophy, Crucible, The Aquarian Press, 1989, ISBN 978-1-85274-061-0. 1992. Thought as a System (transcript of seminar held in Ojai, California, from 30 November to 2 December 1990), London: Routledge. ISBN 0-415-11980-4. 1999. Bohm–Biederman Correspondence: Creativity and Science, with Charles Biederman. editor Paavo Pylkkänen. ISBN 0-415-16225-4. 2018. The Unity of Everything: A Conversation with David Bohm, with Nish Dubashia. Hamburg, Germany: Tredition, ISBN 978-3-7439-9299-3. ^ a b B. J. Hiley (1997). "David Joseph Bohm. 20 December 1917 – 27 October 1992: Elected F.R.S. 1990". Biographical Memoirs of Fellows of the Royal Society. 43: 107–131. doi:10.1098/rsbm.1997.0007. ^ a b David Bohm: Wholeness and the Implicate Order, Routledge, 1980 (ISBN 0-203-99515-5). ^ Adam Becker: What is Real? : The Unfinished Quest for the Meaning of Quantum Physics, Basic Books, 2018. P.115 (ISBN 978-0-465-09605-3). ^ F. David Peat (1997). Infinite Potential: The Life And Times Of David Bohm. Basic Books. p. 21. ISBN 978-0-201-32820-2. If he identified Jewish lore and customs with his father, then this was a way he would distance himself from Samuel. By the time he reached his late teens, he had become firmly agnostic. ^ Garber, Marjorie; Walkowitz, Rebecca (1995). Secret Agents: The Rosenberg Case, McCarthyism and Fifties America. New York: Routledge. pp. 130–131. ISBN 9781135206949. ^ Russell Olwell: Physics and Politics in Cold War America: The Two Exiles of David Bohm, Working Paper Number 20. Program in Science, Technology, and Society. Massachusetts Institute of Technology. ^ Kumar, Manjit (2010-05-24). Quantum: Einstein, Bohr, and the Great Debate about the Nature of Reality. ISBN 9780393080094. ^ Albert Einstein to Patrick Blackett, 17 April 1951 (Albert Einstein archives). Cited after Olival Freire, Jr.: Science and Exile: David Bohm, the cold war, and a new interpretation of quantum mechanics Archived 26 March 2012 at the Wayback Machine, HSPS, vol. 36, Part 1, pp. 1–34, ISSN 0890-9997, 2005, see footnote 8. ^ "Erwin Madelung 1881–1972". Goethe-Universität Frankfurt am Main. 12 December 2008. Archived from the original on 12 February 2012. Retrieved 8 May 2012. ^ Pines, D; Bohm, D. A (1951). "Collective Description of Electron Interactions. I. Magnetic Interactions". Physical Review. 82 (5): 625–634. Bibcode:1951PhRv...82..625B. doi:10.1103/physrev.82.625. ^ Pines, D; Bohm, D. A (1952). "Collective Description of Electron Interactions: II. Collective vs Individual Particle Aspects of the Interactions". Physical Review. 85 (2): 338–353. Bibcode:1952PhRv...85..338P. doi:10.1103/physrev.85.338. ^ Pines, D; Bohm, D. (1953). "A Collective Description of Electron Interactions: III. Coulomb Interactions in a Degenerate Electron Gas". Physical Review. 92 (3): 609–626. Bibcode:1953PhRv...92..609B. doi:10.1103/physrev.92.609. ^ Bell, J.S. (1964). "On the Einstein Podolsky Rosen paradox" (PDF). Physics. 1 (3): 195–200. doi:10.1103/PhysicsPhysiqueFizika.1.195. ^ Mary Lutyens (1983). "Freedom is Not Choice". Krishnamurti: The Years of Fulfillment. Krishnamurti Foundation Trust Ltd. p. 208. ISBN 978-0-900506-20-8. ^ a b c d e David Edmund Moody (2016). An Uncommon Collaboration: David Bohm and J. Krishnamurti. Alpha Centauri Press. ISBN 978-0692854273. ^ J. Krishnamurti (2000). Truth and Actuality. Krishnamurti Foundation Trust Ltd. ISBN 978-8187326182. ^ J. Krishnamurti and D. Bohm (1985). The Ending of Time. HarperCollins. ISBN 978-0060647964. ^ J. Krishnamurti and D. Bohm (1999). The Limits of Thought: Discussions between J. Krishnamurti and David Bohm. Routledge. ISBN 978-0415193986. ^ F. David Peat (1997). Infinite Potential: The Life and Times of David Bohm. Basic Books. ISBN 978-0201328202. ^ a b Gardner, Martin (July 2000). "David Bohm and Jiddo Krishnamurti". Skeptical Inquirer. Archived from the original on 9 March 2015. ^ a b c d David Bohm (1994). Thought as a System. Psychology Press. ISBN 978-0415110303. ^ David Bohm (12 October 2012). On Creativity. Routledge. p. 118. ISBN 978-1-136-76818-7. ^ David Bohm; F. David Peat (25 February 2014). Science, Order and Creativity Second Edition. Routledge. pp. 204–. ISBN 978-1-317-83546-2. ^ F. David Peat (1997). Infinite Potential: The Life and Times of David Bohm. Addison Wesley. p. 80. ISBN 978-0-201-40635-1. ^ Hiley, Basil; Peat, F. David, eds. (2012). Quantum Implications: Essays in Honour of David Bohm. Routledge. p. 443. ISBN 9781134914173. ^ F. David Peat, Infinite Potential: The Life and Times of David Bohm, Reading, Massachusetts: Addison Wesley, 1997, pp. 308–317. ISBN 0-201-32820-8. ^ Kožnjak, Boris (2017). "The missing history of Bohm's hidden variables theory: the Ninth Symposium of the Colston Research Society, Bristol, 1957". Studies in History and Philosophy of Science Part B: Studies in History and Philosophy of Modern Physics. 62: 85–97. Bibcode:2018SHPMP..62...85K. doi:10.1016/j.shpsb.2017.06.003. Thought as a System (transcript of seminar held in Ojai, California, from 30 November to 2 December 1990), London: Routledge. (1992) ISBN 0-415-11980-4. The Quantum Theory of Motion: an account of the de Broglie-Bohm Causal Interpretation of Quantum Mechanics, Peter R. Holland, Cambridge: Cambridge University Press. (2000) ISBN 0-521-48543-6.